TROY, Mich.–Magna has put a new twist on joining thermoplastic materials in order to help automakers cut weight and costs: torsional welding. 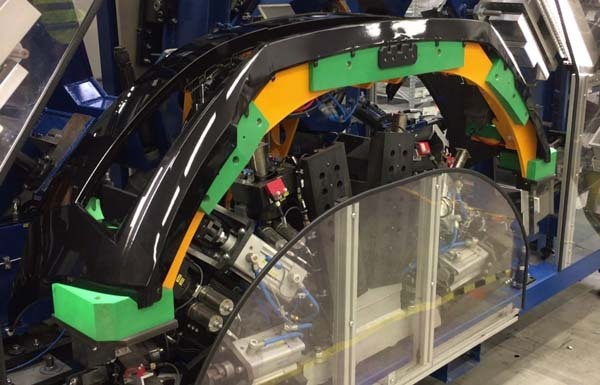 The torsional welding process, developed by Magna (www.magna.com) for automotive applications at its exteriors plant in Liberec, Czech Republic, presents a new way to join plastics. It features a high–speed twisting motion that creates enough friction–based heat to join a plastic bracket to a thermoplastic fascia. The innovative technology achieves an approximate 10 percent weight reduction because it allows thinner materials to be joined, which, in turn, reduces material costs. Torsional welding is currently used to make the front fascia of the 2017 Skoda Octavia, and it has potential for other applications where materials of similar composition need to be joined. There may also be uses for torsional welding with the increase of advanced driver assistance systems and the development of self–driving cars. The trend will be for automotive fascias to become heavier with the increase in autonomous features, due to the addition of sensors. With torsional welding, it's now possible to reduce weight on the outer skin and brackets so more sensors can be added without impacting the overall weight of the vehicle. The Society of Plastics Engineers' Detroit Chapter recognized Magna's torsional welding process with an innovation award at its TPO conference last fall in Troy, Michigan. "We seek every opportunity, from design and materials to enabling technologies, to help customers meet their lightweighting goals," said Magna Exteriors President Grahame Burrow, in a press release. "We appreciate this recognition from SPE and look forward to expanding the use of this innovative process."